We are trying to do our best to support economic growth and job creation. It would be helpful if we could get assistance from some other parts of the government to work with us to help create more jobs. 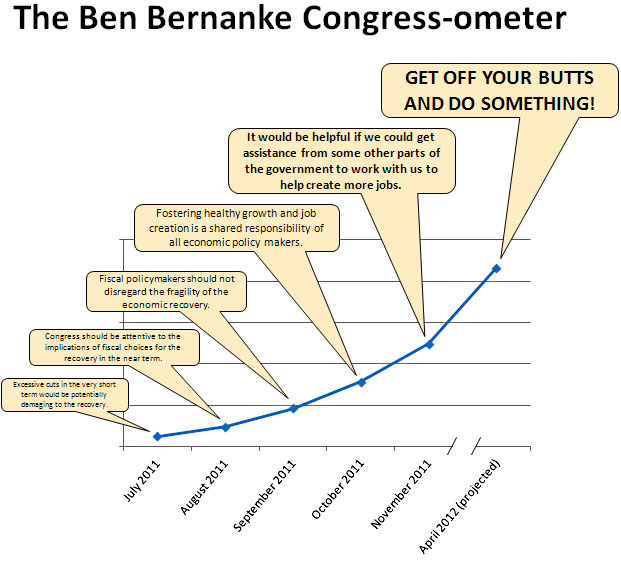 Bernanke’s comments about Congress and its budget-cutting mania keep getting more pointed every time he speaks. It’s not likely to do him any good, of course, but at the rate he’s going I predict that sometime around April of next year he’s just going to give up and say something like, “Will you guys stop griping about the damn budget, get off your butts, and build a few effin bridges instead? Jesus.” I have helpfully illustrated this progression below with quotes helpfully compiled by Steve Benen.